Having the right tools available at the bedside monitor and beyond contribute to improved collaboration. Spacelabs helps to facilitate greater clinical efficiencies by standardizing workflows, providing tools that assist in clinical decision making, and decreasing alarm fatigue, while also improving patient throughput. Managing high-acuity and specialty patient populations can be incredibly challenging. As clinicians are challenged to do more with less, technology can increase your efficiencies. Standardization of workflow is essential. Utilize 3-for-1 Smart Disclosure which includes remote collaboration for a virtually unlimited number of clinicians from any computer. Waveforms for remote consultations provide additional oversight. Once information is gathered and reviewed, print to any networked printer, or print to the EMR. Early ambulation is key to recovery and possibly decreasing length-of-stay. Utilize a Bluetooth wireless ECG system and provide your patients with a telemetry-like solution, promoting increased mobility without expensive infrastructure investments. Awareness of patient status and assurance of actionable alerts are essential, as 85% of alarms have no clinical significance. 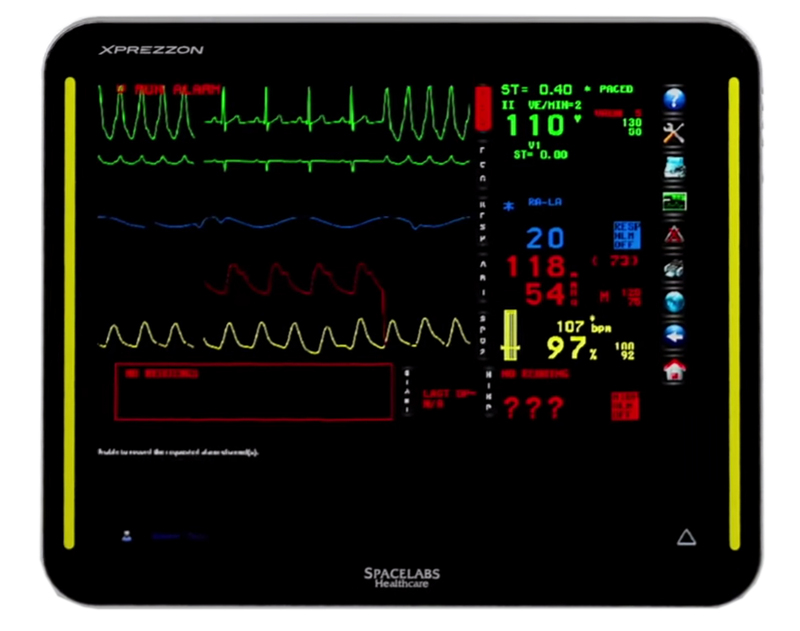 * Utilize Spacelabs tools to quickly determine patient status, assist with clinical decision making and improve the management of alarm fatigue. Assurance Alarm Management tools assist in ensuring that clinicians don’t miss a clinically significant event by providing features like the Alarm History Bar and escalating alarms for certain parameters. Studies show that a decrease of up to 42% of alarms can be realized simply by customizing alarm settings for each patient. * With learned alarms, once a patient is connected to the monitor, the rate and rhythm are learned, and customized alarm limits are set for each patient. Capnography monitoring can be essential in properly evaluating a patient’s ventilation status. The Joint Commission strongly recommends its use in procedural sedation and studies have demonstrated the significant impact of capnography in the care of intubated patients, patients in cardiac arrest, and as an adjunctive therapy in the management of mechanically-ventilated patients. For details on Spacelabs Capno Pod (92516) and Capnography Module (92517), click Capnography. The moment a patient is connected to the monitor, an electronic chart is created for that patient with vital signs and waveforms automatically transferred. Upon admission to the monitor, the patient demographics are now linked to that information, creating a seamless record. A standardized workflow now also includes the effective management of patient and data flow. Improve patient throughput and provide better care with the 24 hour Holter-like analysis. Determine, with confidence, if a cardiac patient is ready for transport out of the ICU or to home. Utilize Qube Mini or the Qube Drive bundle and simply undock the wireless monitor to transport patients with the same high acuity data available at the bedside. Move even the sickest of patients with no decrease in monitoring capabilities. Qube Drive and Qube Mini feature long battery life to go the distance. As Qube and Qube Mini are wireless, vitals are automatically sent to the EMR. After transport, use Data Shuttle to electronically transfer all of the patients’ demographics and monitoring data from the transport monitor to the bedside monitor, simplifying the ADT process while providing a continuous patient record.